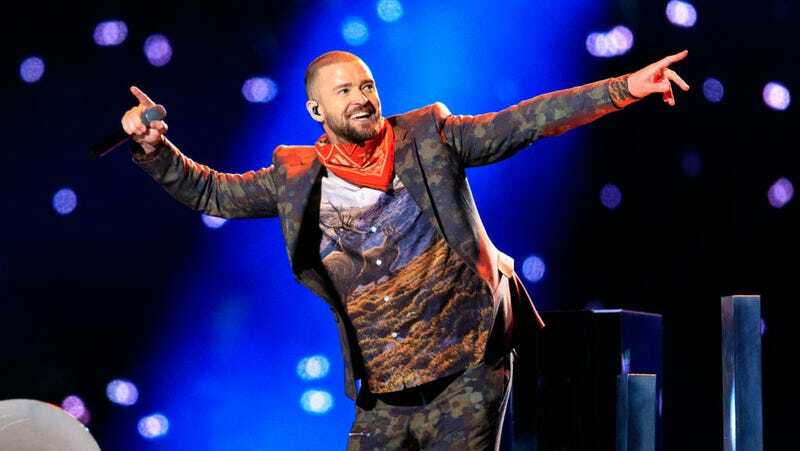 There was a panicked, sweaty sadness in Justin Timberlake’s face as he wrapped up his Super Bowl XLII Halftime Show performance from the stands on Sunday night. “Super bowl selfies,” he shouted, in what was probably the only impromptu line of a well-rehearsed set. The rationale behind the exclaim is unknown—it’s hard to say if it dawned on him that the kid who fiddled with his phone and took a selfie of them during the Trolls song, “Can’t Stop the Feeling,” might draw more headlines than his actual performance. I don’t think that crossed his mind, though. Our man hasn’t seemed too disturbed by backlash lately. In the days leading up to the Super Bowl, it seemed like we were headed toward a disastrous spectacle: There was Man of the Woods, Justin’s dud of a new album that served to justify his booking. There were reports that he might bring out a Prince hologram. Luckily, there was no hologram, and he only performed one Man of the Woods song, though he did not bungle his way through redemption with Janet Jackson, which is probably the only thing that could’ve saved the set. Instead, Timberlake sleepwalked through the hits of old and new. He began with a muddy, poorly mixed version of Man of the Woods cut “Filthy,” barely intelligible vocals partnered with the sharp punctuation of video game sound effects that gave the impression he was racking up points every time he busted a new move. He emerged to the field’s blocky, labyrinth stage setup to “Rock Your Body,” which every Janet fan will remember as the song that set her and Timberlake on two starkly different paths right before Nipplegate. Timberlake made slight tweaks to his hits, updating the hip-hop tinged production of “Sexyback,” turning “My Love” nü-metal. Most of us were holding our breath for the Prince tribute, which was neither offensive enough to merit harsh critique or memorable enough to think he was the right man for the job. Instead of a hologram, we got Prince’s likeness projected on a bedsheet/curtain-looking thing while JT sang “I Would Die 4 U,” at a white grand piano. It creates an interesting dilemma: while less grotesque than a hologram, is this really a more acceptable way to honor the dead? Justin’s performance peaked with “Mirrors,” one of the only chunks of his 2013 The 20/20 Experience double album worth keeping around, before he segued into the concluding Trolls anthem and the aforementioned Super Bowl selfie. No one wants to be left-sharked, or effectively upstaged by a supporting player during your show—when it’s a 13-year-old boy who isn’t a part of his crew, it adds insult to injury. But that’s the dilemma of Timberlake in 2018: the more attention he draws to himself, the worse things get. Selfie Kid’s brief utility as a meme could very well have more staying power than anything else from JT’s performance, if it even gets used once in the next year. A few years ago, there might have been hand-wringing reporting on Selfie Kid (real name Ryan McKenna) for not living in the moment—by staring at his phone instead of the performance directly in front of him—and hell, those are probably being written right this minute. But I can’t blame him. May his 15 minutes last longer than Justin’s 13 minute set.